Benign prostatic hyperplasia (BPH), a histologic diagnosis, is a condition that occurs with aging; the prevalence increases from 25% among men 40–49 years of age to >80% among men 70–79 years of age. Many complications may be developed from BPH such as increased postvoiding residual, bladder diverticula or calculi, vesicoureteral reflux, hydronephrosis, renal insufficiency, and urine retention. Acute urine retention (AUR) is a common urological emergency that is characterized by sudden and painful inability to pass urine. The incidence of AUR in patients with BPH varies widely from 0.4% to 25%. Management of AUR consists of immediate bladder decompression by catheterization usually followed by BPH-related surgery. A trial without catheter (TWOC) is considered preferable to leaving a catheter in place alpha-1 (α-1) blockers decrease smooth muscle tone in the prostate, thereby rapidly improving urinary symptoms and flow. Tamsulosin has a rapid onset of action and is effective in patients with moderate or severe symptoms. The drug is, therefore, a valuable therapeutic option, with both demonstrated and potential advantages over older nonselective agents, in the management of patients with lower urinary tract symptoms (LUTS) associated with BPH. Sixty male patients with acute urinary retention (AUR), secondary to BPH having their first attack, were enrolled in a prospective randomized study. The study protocol had been approved from the local ethical committee at our hospitals. Patients were selected with these exclusion criteria: patients with initial catheterization volume >1000 ml, bladder stones, renal impairment, suspected urethral stricture, neurogenic bladder, cancer prostate, medically induced retention, previous use of alpha-blockers, history of drug hypersensitivity or allergy to tamsulosin, chronic retention. Afer informed consent was acquired from the patients, all patients were catheterized and the urine volume was assessed and subjected to culture and sensitivity tests. After catheter insertion, the patients received prophylactic dose of levofloxacin 500 mg once and they divided randomly into two groups: Group I: 30 patients received tamsulosin hydrochloride 0.4 mg once daily and the catheter removed after 3 days and Group II: 30 patients received tamsulosin hydrochloride 0.4 mg once daily and the catheter removed after 7 days. Radiological investigations: All patients were subjected to pelvi–abdominal ultrasound and estimation of prostate size. Six weeks after catheter removal: The previous investigations were repeated. PSA was repeated only for patients whose first PSA was ≥4 ng/dl. Data management and analysis were performed using Statistical Package for the Social Sciences (SPSS) version 24 for Windows (SPSS Inc., Chicago, IL, USA) comparisons between numerical variables of two groups were done by Student's unpaired t-test for parametric data and categorical variables were done by Chi-square test or Fisher exact test for small sample size, P value was considered significant when P > 0.05. Between March 2017 and August 2017, this study was conducted at the Department of Urology, Al-Azhar University Hospitals and Om El-Masryeen General Hospital. The mean patients' age was 59.9 ± 8.9 years; prostatic volume ranged from 30 to 147 cc with mean of 59.7 ± 24 cc. Urine volume collected in the urine bag immediately after catheterization was recorded. Retained volume ranged from (450 to 1000 ml) with mean of 672.6 ± 153.6 ml. Screening serum PSA was done for all patients in the 2nd-week follow-up after catheter removal. median PSA level of the studied cases was 2.65 (interquartile range = 1.7–3.9) ng/ml. The IPSS was assessed for all patients during the first clinical examination. Mean IPSS of the studied cases was 13.25 ± 3.56 (ranged from 6 to −22). After catheter removal, 65% of patients voided successfully while 35% failed TWOC. the volume of residual urine was assessed in cases who voided by ultrasound and ranged from 0 to 182; median was 50 ml. Qmax was assessed in cases who voided by uroflowmetry and ranged from 10 to 22.6 with mean 17.56 ± 3.02 ml/s. The overall complication was 30%, included obstruction in 6.7%, UTI in 20%, hematuria in 10%, and urinary leakage in 3.3% of cases. Bivariate analysis was carried out to identify factors that may affect the TWOC failure [Table 1]. The difference between mean age among failed and succeeded cases are significantly different (P = 0.04). Furthermore, the IPSS was P = 0.039. Age among cases with complications and those without were significantly different (P = 0.003) also was IPSS (P = 0.021). Comparision between the groups was carried out [Table 2], Group I: 18 cases (60%) had a successful voiding compared to 21 cases (70%) in Group II. The difference was not statistically significant (P = 0.4). Group I had a complication rate (16.7%) and it was statistically significant when compared to Group II (43.3%) (P = 0.0.02) [Table 3]. Clinical BPH is one of the most common diseases in aging men which can lead to LUTS. The prevalence of BPH rises markedly with increased age. Autopsy studies have observed a histological prevalence of 8%, 50%, and 80% in the fourth, sixth, and ninth decades of life, respectively. As regarding age of the cases, our study demonstrated that there was significantly different in TWOC outcome with age as the mean age among succeeded cases was 58.03 ± 8.02, while among failed cases was 63.23 ± 9.55 (P = 0.03). A retrospective study conducted by Bansal and Aditi Arora of 2188 patients presenting with first episode of AUR between January 2009 and July 2016 showed that age was an independent predicting factor of successful TWOC for AUR and that patients older than 65 years were at a 1.84 times higher risk of failure of TWOC than were those younger than 65 years. However, Lucas et al. in 2005 and Mariappan et al. in 2007 found that the efficacy was similar across the age range and no association between TWOC outcome and age. Our results showed that prostate volume is an insignificant predicting factor of successful TWOC for AUR where mean prostate size among succeeded cases was 56.10 ± 19.05 while mean size in failed cases was 66.29 ± 30.54 (P = 0.175), this may be due to the small number of patients in our study (n = 60). Our study statistically showed that patients with prostate volume ≥50 cc were at 1.62 times higher risk of failure of TWOC than those with >50 cc (61.9% vs. 38.1) and those with volume ≥60 cc were at 1.1 times (52.4% vs 47.6%). Previous studies by Kumar et al. in 2000 and Zeif et al. in 2010 also demonstrated that failure of TWOC was associated with larger prostate size. However, studies by Tan and Foo in 2003 and Djavan et al. in 1997 showed contradictory negative results. Bivariate analysis was carried out in our study to identify factors related to TWOC outcome, we found that retained urinary volume at time of catheterization among succeeded was 656.41 ± 162.69 ml and among failed cases was 702.76 ± 133.53 ml, but the difference was statistically insignificant (P > 0.1). Several studies have shown that retained volume has no prognostic significance for the prediction of success of TWOC. On the contrary, various studies have proved that if residual volume at catheterization is 1 L or more, it could be a risk factor for failed TWOC, which suggests a correlation between RV and outcome of TWOC. Taube and Gajraj in 1989 found that the successful outcome of TWOC is associated with retained volume >900 ml. Similarly, our data showed that retained volume of ≥650 ml is associated with increased failure rate of TWOC but it was statistically insignificant (P = 0. 09). This may be because of prolonged bladder distension due to large volume of residual urine which may result in ischemia and axonal degeneration leading to loss of bladder tone. The relationship of baseline AUA symptom score IPSS with the success of TWOC is poorly understood in literature. In this study, men with successful TWOC had significantly lesser AUA score than those with failed TWOC (12.56 ± 3.5 vs. 14.52 ± 3.3, P < 0.04). Our results are consistent with those of Bhomi and Bhattachan in 2011 who also confirmed that patients with low AUA score had significantly higher chances of successful TWOC. However, Djavan et al. in 1997 showed no correlation of AUA score with outcome of TWOC. Lim et al. in 1999 studied the association of serum PSA with outcome of TWOC and showed that serum PSA is significantly higher in patients in whom TWOC failed and assumed that it is due to prostatic infarction or infection giving rise to AUR. However, Zeif et al. in 2010 found no impact of serum PSA level on the outcome of TWOC. Our study demonstrated that 65% of cases who received tamsulosin before catheter removal succeeded TWOC while 35% failed. McNeill et al. in 2004 found in their study that the use of α-blockers increases the TWOC success rate compared to placebo, 61.9% versus 47.9%, which approximate our study success rate. Similar findings are reported by Reten-World Study Group where the prevalent use of α-blockers (86%) worldwide is noted with the result doubling success rate of TWOC. In controversy, Desgrandchamps et al. in 2006 found that the success rate of a TWOC was also higher when the catheter was removed after 1–3 days than for a longer duration of catheterization. In their survey, the TWOC success rates were greater for short catheter duration (63.2%, 52.7%, and 52.5% after 1, 2, and 3 days, respectively) than longer catheter duration (41.5% and 46.9% for 4–7 and >7 days, respectively). The study was not randomized and this may reflect differences in the clinical profile of patients. As regarding complications of catheterization, our study showed that the overall complications rate was 30% and the complication rate was statistically significantly higher in the group who catheterized for 7 days (43.3%) (more than one complication occurred in one patient) than the group who catheterized for 3 days (16.7%) (P = 0.024). In 2011, Fitzpatrick et al. found that catheterization for >3 days was associated with a significantly higher rate of adverse events compared with those catheterized for 3 days or less (33.8% vs. 19.7%, P < 0.001) which was in agreement with our study. Our study showed that people with catheter for 7 days had UTI significantly higher than those with catheter for 3 days (33.3% vs. 6.7%, P = 010). Furthermore, Stensballe et al. in 2007 found that people with catheters acquire bacteriuria at different rates. Incidence of conversion from sterile urine to bacteriuria occurs at the rate of 3%–10% per day in agreement with our study that showed increases the risk of UTI 6.65% per day with prolonged duration of the catheter. Urethral catheterization followed by a TWOC is the standard practice worldwide and that alpha-1 blockade before TWOC increase the chances of success, success rate of TWOC was controversial regarding early catheter removal compared to late catheter removal. Late catheter removal was observed to be accompanied by significant increased prevalence of adverse effects such as catheter blockage, hematuria, UTI, and urinary leakage. Finally, to get more data and more valuable statistics, more studies on a larger number of cases should be done. First and foremost, I would like to thank “ALLAH” for everything. This would not be achieved without the support of “Allah.” I would like to express my sincere gratitude and appreciation to Prof. Dr. Mohamed Mabrouk Badr Professor of Urology, faculty of medicine, Al-Azhar University, for his constant help and valuable instructions through this work. It was pleasure and privilege to work under his guide and supervision. I owe special gratefulness and much regard to Dr. Mohamed Fathy El Saeed El Ebiary, Lecturer of Urology, Faculty of Medicine, Al-Azhar University for his helpful and close experienced supervision. His guidance and valuable advice was behind the accomplishment of this work. He provided me with the knowledge and facilities without which I would never be able to complete this work. I would be remiss if failed to acknowledge my family for their tolerance and their emotional support pushing me to finish this work. Finally, thanks to all patients included in our study and to everyone who helped me in the Urology Department, Al-Azhar University. Sarma AV, Wei JT. Clinical practice. Benign prostatic hyperplasia and lower urinary tract symptoms. N Engl J Med 2012;367:248-57. Oelke M, Kirschner-Hermanns R, Thiruchelvam N, Heesakkers J. Can we identify men who will have complications from benign prostatic obstruction (BPO)? ICI-RS 2011. Neurourol Urodyn 2012;31:322-6. Kara O, Yazici M. Is the double dose alpha-blocker treatment superior than the single dose in the management of patients suffering from acute urinary retention caused by benign prostatic hyperplasia? Urol J 2014;11:1673-7. McNeil SA. Spontaneous versus precipitated AUR: The same? World J Urol 2006;24:354-9. Lucas MG, Stephenson TP, Nargund V. Tamsulosin in the management of patients in acute urinary retention from benign prostatic hyperplasia. BJU Int 2005;95:354-7. Montorsi F, Moncada I. Safety and tolerability of treatment for BPH. Eur Urol Suppl 2006;5:1004-12. Dunn CJ, Matheson A, Faulds DM. Tamsulosin: A review of its pharmacology and therapeutic efficacy in the management of lower urinary tract symptoms. Drugs Aging 2002;19:135-61. Yoon PD, Chalasani V, Woo HH. Systematic review and meta-analysis on management of acute urinary retention. Prostate Cancer Prostatic Dis 2015;18:297-302. Lim KB. Epidemiology of clinical benign prostatic hyperplasia. Asian J Urol 2017;4:148-51. Berry SJ, Coffey DS, Walsh PC, Ewing LL. The development of human benign prostatic hyperplasia with age. J Urol 1984;132:474-9. Bansal A, Arora A. Predictors of successful trial without catheter following acute urinary retention in benign prostatic enlargement: A single centre, multivariate analysis. Neurourology and urodynamics 2017;36:1757-62. Mariappan P, Brown DJ, McNeill AS. 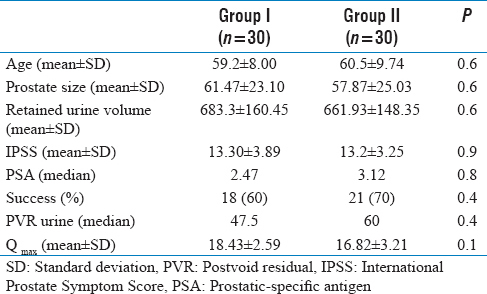 Intravesical prostatic protrusion is better than prostate volume in predicting the outcome of trial without catheter in white men presenting with acute urinary retention: A prospective clinical study. J Urol 2007;178:573-7. Kumar V, Marr C, Bhuvangiri A, Irwin P. A prospective study of conservatively managed acute urinary retention: Prostate size matters. BJU Int 2000;86:816-9. Zeif HJ, Wallace DM, Subramonian K. Predictors of successful trial without catheter in acute urinary retention. Br J Med Surg Urol 2010;3:5-10. Tan YH, Foo KT. Intravesical prostatic protrusion predicts the outcome of a trial without catheter following acute urine retention. J Urol 2003;170:2339-41. Taube M, Gajraj H. Trial without catheter following acute retention of urine. Br J Urol 1989;63:180-2. Bhomi KK, Bhattachan CL. Factors predicting the success of a trial without catheter in acute urinary retention secondary to benign prostatic hyperplasia. Nepal Med Coll J 2011;13:178-81. Lim KB, Wong MY, Foo KT. The outcome of trial off catheter after acute retention of urine. Ann Acad Med Singapore 1999;28:516-8. Emberton M, Fitzpatrick JM. The reten-world survey of the management of acute urinary retention: Preliminary results. BJU Int 2008;101 Suppl 3:27-32. Desgrandchamps F, De La Taille A, Doublet JD; RetenFrance Study Group. The management of acute urinary retention in France: A cross-sectional survey in 2618 men with benign prostatic hyperplasia. BJU Int 2006;97:727-33. Fitzpatrick JM, Desgrandchamps F, Adjali K, Gomez Guerra L, Hong SJ, El Khalid S, et al. Management of acute urinary retention: A worldwide survey of 6074 men with benign prostatic hyperplasia. BJU Int 2012;109:88-95. Stensballe J, Tvede M, Looms D, Lippert FK, Dahl B, Tønnesen E, et al. Infection risk with nitrofurazone-impregnated urinary catheters in trauma patients: A randomized trial. Ann Intern Med 2007;147:285-93.